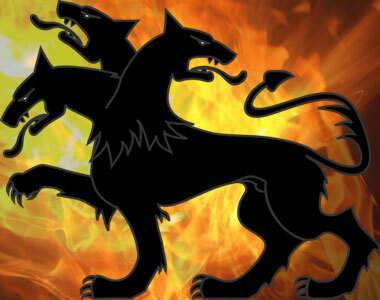 Cerberus (Greek mythology) is best known as the guardian to the gates of Hades (the Underworld). In Greek mythology Cerberus is depicted as a dog with three ferocious heads and the tail of a snake. He is one of the great Greek monsters born unto the infamous Typhon and Echidna. His sole task is essentially be the "bouncer" of Hades. As the rules go, only the dead may enter the Underworld, and none may leave. There are only a couple of myths in Greek mythology where a hero gets the better of Cerberus. The first is when Orpheus (Greek mythology), the famed musician, sneaks into Hades by lulling the usually unstoppable Cerberus to sleep with his beautiful music. The second myth is when Hercules (Greek mythology), with the approval of Hades (Greek mythology), the god of the Underworld, gets Cerberus in a choke hold, knocks him out, and kidnaps him. He is eventually returned to his post where he remains to this day. Other than these myths, the three-headed hound of Hell is an unmatched force for anyone trying to get in or out of Hades without express permission. In vampire mythology, it is said that the souls of all vampires are held in a container (a coffin, appropriately), somewhere in Hades. According to the Vampire Origin Story, because of a deal made by the first vampire, if any vampire should ever return to Hades they can get in (because technically they are dead), but they can never leave again. Some believe that due to his unmatched dedication to the gods of ancient Greece, Cerberus was eventually released by Hades and was able to join the gods in a more human immortal form, thereafter being known by the name Naberius. Return from Cerberus (Greek mythology) to the List of Mythical Creatures page.